Most of you know that I'm currently into Depron models. It's nice and easy to work with, but the process can be tedious: the plan on the computer is printed on to a number (usually 9 or 12) of A3 sheets which are then lined up and taped together. The parts are then roughly cut out, stuck to the Depron with spray adhesive, and cut round. Wouldn't it be nice, I wondered, if I could go straight from the computer file to cut-out parts? After all I have a CNC machine. The problem is that a rotating cutter doesn't really work with soft materials like Depron. The cutting bit chews the Depron, lifts up the sheet, and tries to push it sideways especially when cutting thin parts. 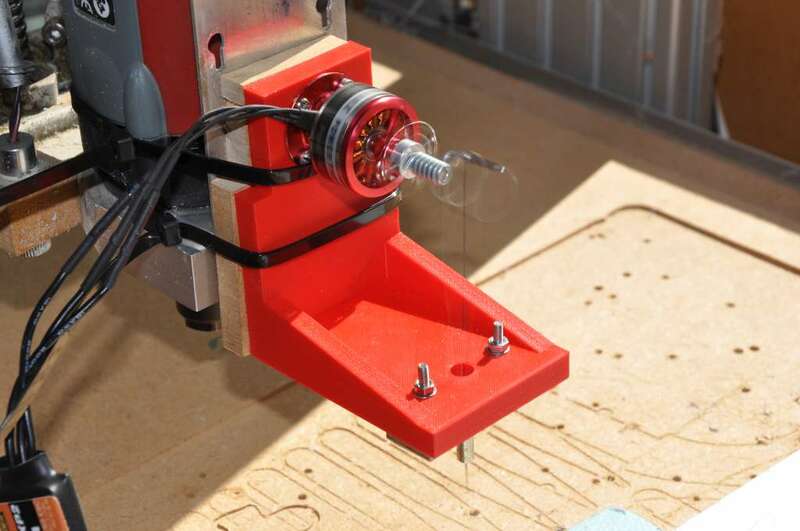 A laser seems the obvious choice, but high-power laser cutters in reasonable sizes are hugely expensive, fragile and dangerous. Low power lasers, while cheap, don't work with white Depron as the beam just gets reflected. Recently however, I came across a fascinating thread on the Flitetest forum where an American aeromodeler had developed a way of cutting Depron based on a reciprocating needle - a piece of piano wire moved up and down like the needle of a sewing machine, punching a series of joined up tiny holes as it moves along. The concept is so simple that I had to have a go. So here it is, made of parts I already had; a motor & speed controller, a spring from a clothes peg(! ), piano wire and a bit of brass tube for the nozzle / guide. And it works! Temporarily lashed to the CNC machine and switched through a spare receiver just to prove the concept, it cut out this test piece first time. Since there is no significant force on the Depron, a couple of small lead weights were all that was needed to hold it in place. So my next project will be to build a bigger CNC machine to cut a full Depron sheet (1250mm x 800mm) in one go. 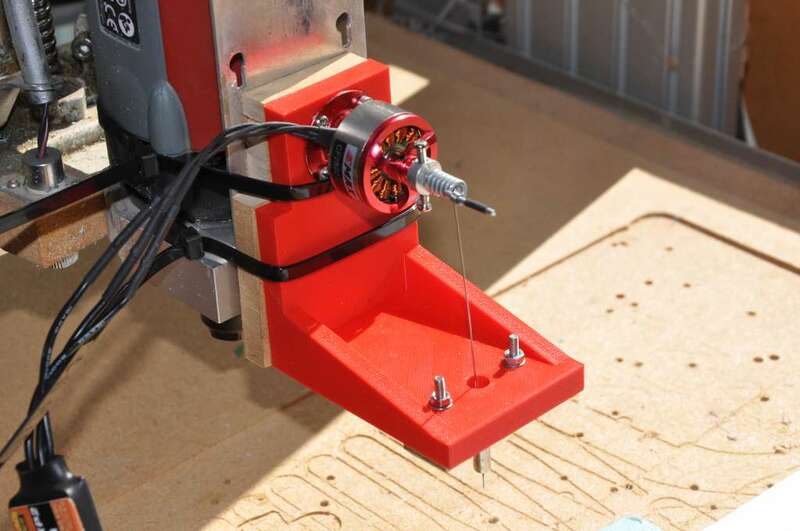 Because of the tiny forces, much smaller motors and rails can be used compared with a 'normal' CNC machine. It will have to be easily dismantled as I don't have the space for a permanent machine of that size. Ian, I take my hat off to your ingenuity, fantastic !!! Impressive stuff Ian, well done! Great idea and yet a bit more work for the 3d printer me thinks. 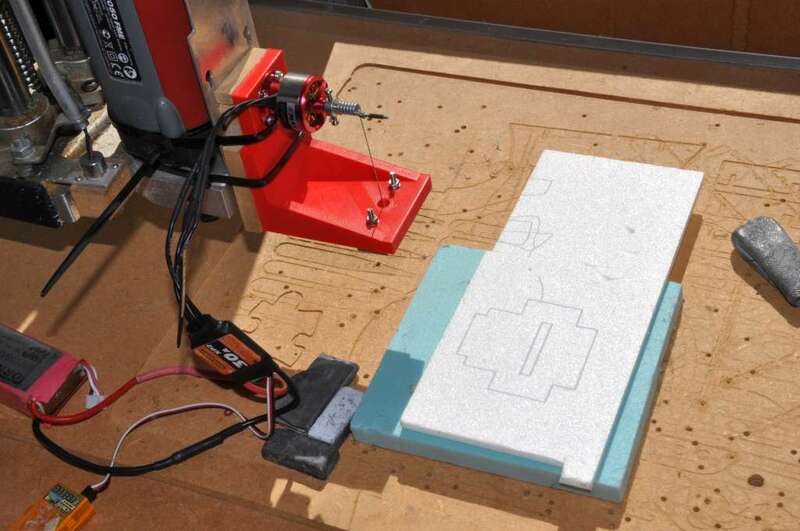 …so as I was saying… (almost a year ago) the next step is to make a bigger CNC machine. And finally after much fiddling and several re-designs, here it is. 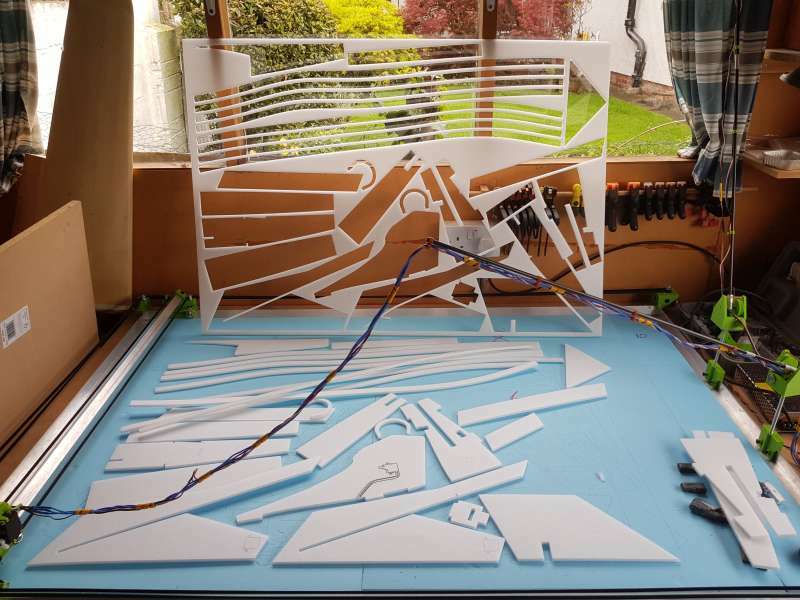 Today it flawlessly cut out parts from two and a half sheets of Depron for my next project, the Buccaneer, for which I’ll do a separate thread shortly. The accuracy is excellent, parts are exactly the right size and fit perfectly, and after all this effort it’s great to just sit there and watch several dozen parts just appear. 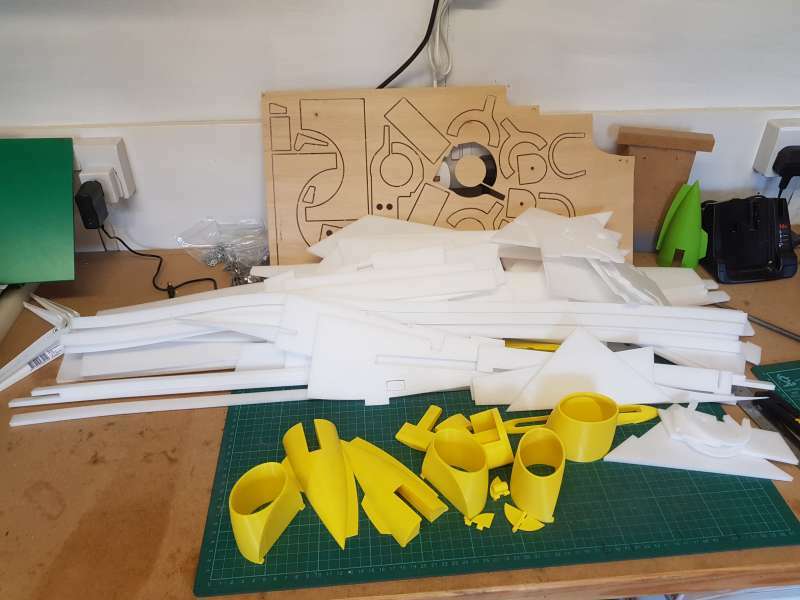 And while this was going on the existing CNC machine was cutting out the lite-ply parts and the 3D printer was making the other bits! For anyone really interested in the details, all this came from this thread on the FliteTest forum, but beware it’s a long thread spanning 2 years and 100 pages. I will probably post some technical details there soon. Wow thats amazing Ian - be interested in seeing this progress!